HALLIE SMITH is a composer and violinist from Simsbury, CT. She began her musical studies on the violin at age four and has performed with youth orchestras in the Concertgebouw, (Amsterdam, Holland) Carnegie Hall, and Boston Symphony Hall. Her violin teachers include Donna Ngai, Jaroslaw Lis, Susan Waterbury, and Liesl Schoenberger. 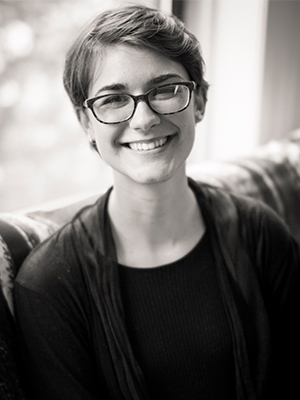 She has attended summer programs for composition at Oberlin Conservatory and The Yellow Barn Young Artists Program. In 2013, Hallie was awarded second place in the MuSE Young Composer’s competition. Hallie is also actively involved in the Center for The Development of Arts Leaders through NPR’s From the Top, and has held an internship at Boston Musica Viva. She currently studies composition at the Boston Conservatory, studying with Mischa Salkind-Pearl. Aside from music, Hallie enjoys swimming, running, reading, and petting dogs and cats. Hallie is a member of the Center for Development of Arts Leaders (CDAL) in Boston.